Our water system recently violated a drinking water standard. Although this is not an emergency, you as our customers have the right to know what happened, what you should do, and what we are doing to correct the situation. We routinely monitor for the presence of drinking water contaminants. Test results for 01/1/2019 and 03/31/2019 show that our system exceeds the standard or maximum contaminant level (MCL) for Haloacetic Acids. The average level of Haloacetic Acids over the last four quarter was 62.6µg/L at SM#2 CHERRY FORK RD, MONTROSE location. The standard for Haloacetic Acids is 60.0µg/L. You do not need to use an alternative (e.g. bottled) water supply. However, if you have specific health concerns, it is recommended you consult your doctor. This is not an immediate risk. If it had been, you would have been notified immediately. However, some people who drink water containing Haloacetic acids in excess of the MCL over many years may have an increased risk of getting cancer. Haloacetic acids are a byproduct of the disinfectant residual, organic content at the time of disinfectant application, water temperature, and detention time (water age). Leadsville PSD has limited control over the over the treatment process being a class WD purchasing system. All water is purchased from the city of Elkins. Leadsville PSD is currently working the City of Elkins water plant and WV-DHHR-BPH-OEHS to find solutions for these high levels. As of February 2018, the City of Elkins has been operating its new water plant which has changed the process from which the District receives water. Changes to the District’s flushing plan may be needed and the District has taken additional sampling to help determine what changes will need to be made. The average level of Haloacetic Acids over the last four quarter has dropped to 62.6ug/L from the previous four quarter level of 64.5ug/L. The current high average includes the test results for 7/1/2018 and 9/30/2018 resulting in a continued high average. For more information, please contact Carl McGlynn at 304-636-8834 or PO Box 1336, Elkins, WV 26241. Please share this information with all other people who drink this water, especially those who may not have received this notice directly (for example, people in apartments, nursing homes, schools and businesses). You can do this by posting this notice in a public place or distributing copies by hand or mail. We routinely monitor for the presence of drinking water contaminants. Test results for 10/1/2018 and 12/31/2018 show that our system exceeds the standard or maximum contaminant level (MCL) for Haloacetic Acids. The average level of Haloacetic Acids over the last four quarter was 64.5µg/L at SM#2 CHERRY FORK RD, MONTROSE location. The standard for Haloacetic Acids is 60.0µg/L. The average level of Haloacetic Acids over the last four quarter has dropped to 64.5ug/L from the previous four quarter level of 75.7ug/L. The current high average includes the test results for 7/1/2018 and 9/30/2018 resulting in a continued high average. We routinely monitor for the presence of drinking water contaminants. Test results for 7/1/2018 and 9/30/2018 show that our system exceeds the standard or maximum contaminant level (MCL) for Haloacetic Acids. The average level of Haloacetic Acids over the last four quarter was 75.7µg/L at SM#2 CHERRY FORK RD, MONTROSE location. The standard for Haloacetic Acids is 60.0µg/L. Haloacetic acids are a byproduct of the treatment process. Leadsville PSD has no control over the treatment process being a class WD purchasing system. All water is purchased from the city of Elkins. Leadsville PSD is currently working with Midland PSD, the City of Elkins water plant and WV-DHHR-BPH-OEHS to find solutions for these high levels. As of February 2018, the City of Elkins has been operating its new water plant which has changed the process from which the District receives water. Changes to the District’s flushing plan maybe be needed and the District will possibly do additional sampling to help determine what changes will need to be made. 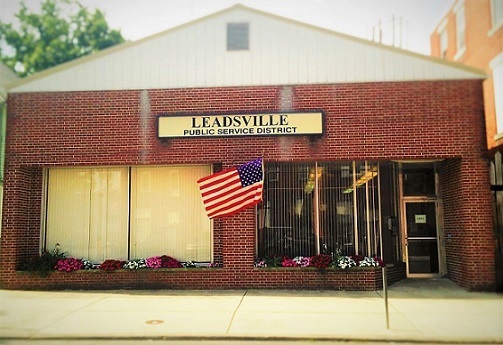 Leadsville Public Service District provides sewer service to portions of Crystal Springs, Highland Park, portions of Harpertown, Woodridge, and Cravensdale areas of Elkins. The District provides water service to the Cravensdale, Gilman, Kerens, and Montrose areas outside of Elkins. Payments can be made at Davis Trust Co if you have your bill card. Regulated by the Public Service Commission (PSC) of WV. Rate schedule and adjustment policies are available upon request. Our Board meets every third Wednesday of each month. For any boil water advisories affecting the City of Elkins water, please call (304) 637-3582. You must have your credit card and your bill available in order to enter other needed information. Note: SOFTtelPay will charge a nominal fee for using this service.